Let's turn our attention to indexing this month, otherwise known as 'dividing work'. 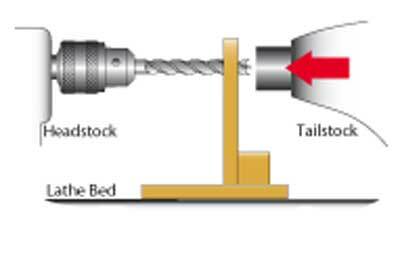 In woodturning terms, this is an area of working which changes the function of a lathe from a revolving machine that shaves away a form in a workpiece, to one of a stationary jig that allows a workpiece to be retained on its axis whilst it is 'divided' into precise equal divisions of its circumference; this is done by either marking out or with the direct application of a tool e.g. a drill, saw, etc. This might sound a bit daunting at first but when broken down into practical elements, indexing is quite easy to use and does not require a mathematical mind. The issue of indexing presents a bit of a conundrum for chuck makers, as it is known that the facility is fairly high on the list of desirable features when a turner is choosing a woodturning chuck. However, less than 5 per cent of turners owning a chuck with indexing holes ever purchase the means of being able to utilise the facility, such as an indexing arm, for example. The aim here is to remove any barrier (perceived or otherwise), and allow the techniques of indexing to be more readily understood, enjoyed, and easily incorporated into future projects. 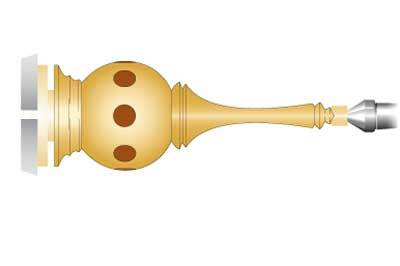 For the purposes of this article, the scope is generally restricted to use in association with hand turning work, and because an indexing facility is now common on chucks, most examples are illustrated. 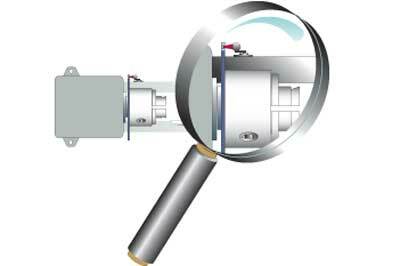 Basically, it requires a chuck with indexing holes or a dividing plate (or division plate). A rarely used term is 'alidade' which means graduated or revolving radius. An indexing arm is added to this and the means of mounting it in a fixed position is relative to the axis line of the plate or chuck. 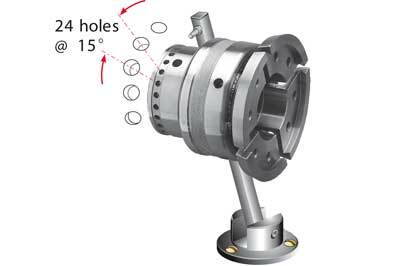 The holes in a dividing plate, chuck, or similarly endowed spindle mounted accessory provide fixed spacing that give either equally fixed angles, or equally fixed divisions of a circumference (the circular measurement of any diameter) of a workpiece â€“ actual diameters do not matter. Irrespective of the work piece size, the divisions are always equal. A positive location is worth spending some initial effort to achieve. However, the following steps will make mounting a fairly straightforward procedure. If you own a toolpost mounted drilling guide, skip this part, and move on to step 2. If not, now would be a good time to make one. It is two pieces of suitable board material (MDF, plywood, or thin wood), and a small block of wood for rigidity. If judging the centre height of the drilling axis is difficult, use the following method. 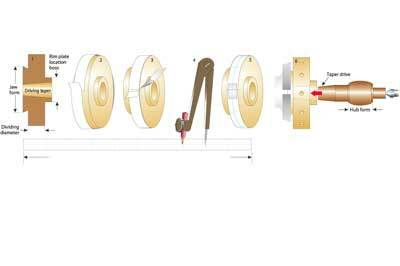 Slide the guide assembly on to the lathe bed (or top of the lathe stand), and use the tailstock quill to feed the drill through the guide. If the guide hole is larger than the bore of the quill, use a piece of scrap board to protect it. Turn a suitable length of contrasting wood to produce eight inlays. Allowing for saw cuts and a drill depth of around 5mm (3/16in) a turned length of 75mm (3in) or so should be sufficient. 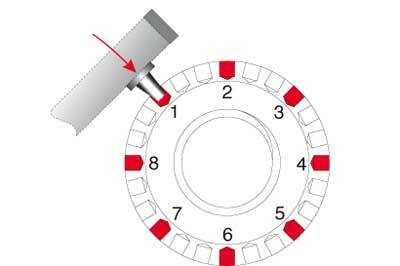 The holes are 8mm (5/16in) diameter and to ensure the inlays are a close fit, use the drilling guide hole as a turning gauge. in place. This is also recommended if don't have a toolpost drilling jig, but wish to make alternate inlays of a different diameter. Using a felt tip pen mark the eight holes as this avoids any mistakes. They don't need to be numbered. 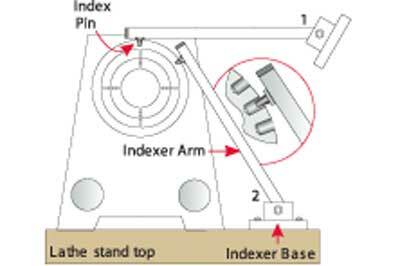 Place the drilling guide on the top surface of the lathe stand, or bed, aligned with the ball section of the ring stand. 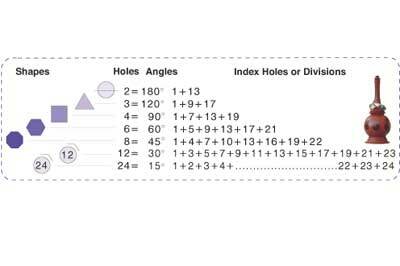 Engage the index pin in the first hole and mark the positions with the centre point of the drill. 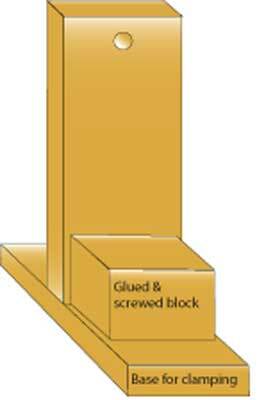 If drilling to depth, clamp or screw the drilling guide in position and put a ring of parcel tape on the drill to the indicated depth. If drilling after marking, put the tape on the drill accordingly. Repeat this procedure for the all the remaining holes. Glue the plugs in carefully â€“ this can be done by pushing the end of the inlay dowel into the first hole, and then cutting it off with a fine hacksaw. Note: Use a 'G' clamp if the inlays need a little encouragement. 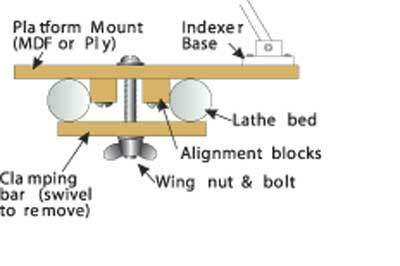 Mounting can be on the lathe stand or on a platform constructed to suit the lathe bed. For safety reasons, mounting the arm at the rear of the lathe is recommended so it can be safely swung away during turning operations. 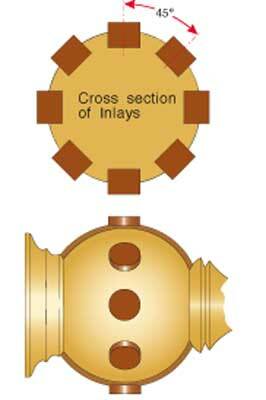 If the lathe centre is high, and if room allows, consider building up the base height so that the index pin can be more clearly seen as it enters the holes. 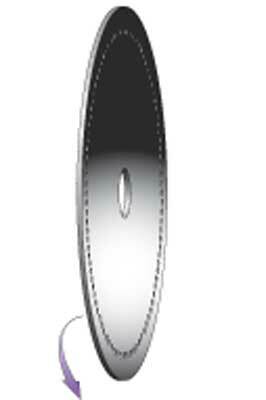 Engage the tapered pin at a tangent to the index hole in the chuck or dividing plate. While holding the index pin in position, rotate the assembly until the base is seated flush with the bench top. Holding the index base firmly against the bench top, try disengaging and re-engaging the index pin. If necessary, adjust alignments until it is an easy fit. With the pin still engaged, mark the fixing hole positions, remove assembly, drill the pilot holes for the fixing screws, and fix the indexer base to bench, checking that the arm can engage easily. Finally tighten the fixing screws with the tapered pin engaged. The indexer is now ready for use. 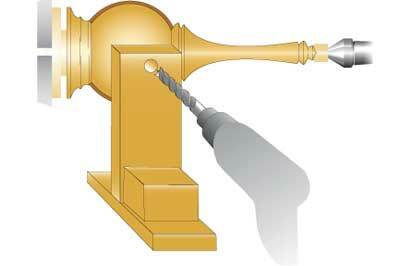 This method allows a little more flexibility, particularly if you have a lathe with a swivelling headstock. If you donï¿½t have a chuck, or other means, you could still make items that require indexing by adopting the paper indexing method described below. 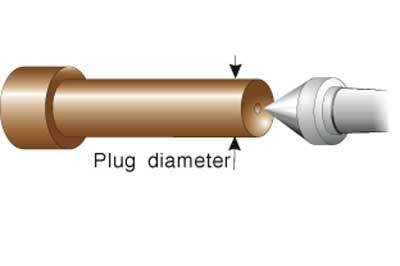 Lack of an indexing arm can likewise be overcome by making a simple stand â€“ similar to the drilling guide, but with a taper ended dowel in lieu of the drill hole. Sometimes an indexing job crops up which canï¿½t be performed with the usual proprietary equipment â€“ five and ten-spoke wagon wheels are a good example. This can be overcome with this method, and you get a good work holding.